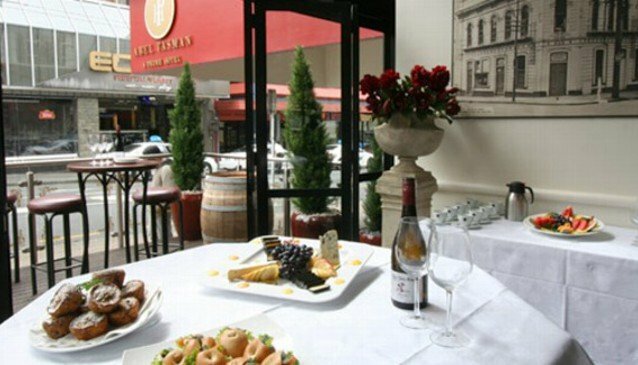 Casual dining in this chic bistro within the Abel Tasman Hotel in Wellington's CBD. Open for breakfast, lunch and dinner with an interesting range of dishes. Indoor and outdoor seating. Corner Bistro 169 is open all day, for both residents and non-residents of the hotel. But it's not a typical hotel cafe-restaurant - the menu here is decidedly European/Mediterranean in flavour and extra special effort has been made to create a warm, vibrant atmosphere, synonymous with European cafe culture. Breakfasts can be continental or cooked - the '169 Breakfast' is very popular and will set you up for the day. Lunch is a very classy affair, offering anything from seafood chowder (with 169's special ingredient...) to an open steak sandwich. But it's dinner where Corner Bistro 169 really excels. For the relatively small size of the place, the menu is impressive. Entrees include Warm Black Pudding, Poached Chicken & Smashed Olive Terrine (sounds painful...) and a House Made Ricotta & Spinach Tart, whilst the mains step up another gear, with Saltimbocca and the Moroccan Slow Braised Lamb Shoulder particular highlights. You'll want to take your time here, so don't be afraid to spend an extra half hour watching Wellington rush by outside the window, with a Lemon Curd Tart or Strawberry Parfait sat invitingly in front of you. You can also dine outdoors, weather-permitting. There is a good wine list, and varied selection of other beverages, including draught beers, so it's a great place to unwind after a tough day's sightseeing. Pricing is moderate, so it won't break the bank, either.